It would be fairly easy to say that even when Jeremiah Kipp is kinda sorta playing around with filmmaking, he's still one of the finer indie filmmakers around. The proof of this comes from his short film Lost & Found, a 7-minute short film released on Vimeo on John Milton's birthday that feels improvisational in spirit yet is remarkably cohesive and absolutely a joy to watch unfold. 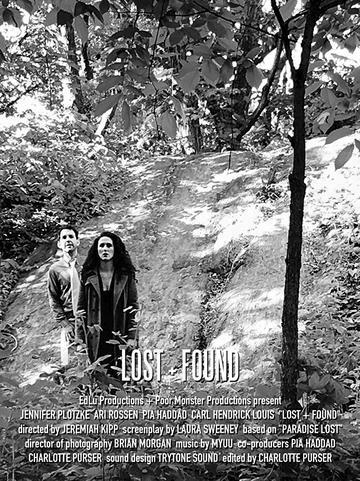 As you might guess, Lost & Found is a short adaptation of John Milton's Paradise Lost with a screenplay by Laura Sweeney and Kipp's direction giving the film a contemporary feeling that is faithful thematically to Milton's ideologies and incorporates pieces of Milton's rhythmic, captivating dialogue. In the film, Satan (Jennifer Plotzke) and Beelzebub (Ari Rossen) opt to ascend to earth in search of those which have recently gained God's favor - humans, represented in the persons of Adam (Carl Hendrick Louis) and Eve (Pia Haddad). Satan and Beelzebub encounter their humans sleeping on the ground, concocting a plot that should be familiar to those familiar with Milton's work. If you're not familiar with Milton's work, you should be. Go read it. Like now. Okay, you're back? So, you got it? Right? Lost & Found largely avoids the more Christian-focused symbolism evident in Milton's writing, focusing on the ideas and themes that play out in the writings and setting them in a more contemporary setting. However, the film is also adapted in such a way that you'll likely take away from it what you're going to take away from it anyway. The first thing that you should take away from Lost & Found is that it's a mesmerizing film, beautifully acted by our leading quartet with an air of naturalness that drew me in and never let me go. I've never quite enjoyed spending so much time with Satan. I'm probably gonna' have to go to confession tomorrow and I'm not even Catholic. Seriously, though, Jennifer Plotzke is absolutely stellar here. She takes Milton/Sweeney's dialogue and turns it into an absolute work of cinematic art. While Ari Rossen is equally up to par with the dialogue, the truly fantastic part of Rossen's performance is watching Rossen's facial expressions and body language standing alongside Plotzke's rhythmic to and fro of dialogue. It all feels like stage and cinema all rolled into one. While their performances are undeniably quieter, Carl Hendrick Louis and Pia Haddad are equally compelling as Adam and Eve as the simplicity of their actions unfolds. Brian Morgan's lensing is simply stellar, while the original music by Myuu lulls one into an unwarranted comfort. There are filmmakers who simply know how to make films and Jeremiah Kipp is one of them. Lost & Found is simple yet extraordinary, a quiet little gem of a film that had me wanting to watch it all over again as the closing credits were rollilng and wanting to re-immerse myself in Milton's "Paradise Lost."